When I was a Lutheran considering Orthodoxy, I went searching for something that resembled the Lutheran Book of Concord. The Concordia (its original Latin title) contains seven different documents of varying lengths and genres written within a fifty year period. Those documents are preceded by the three standard creeds in the Western Church: the Niceno-Constantinopolitan Creed, the Apostolic Creed, and the “Athanasian” creed (Quicumque Vult). They are not ethical but doctrinal or dogmatic norms which define and identify Lutherans in contrast to other Christian groups (Anglicans, Roman Catholics, Calvinists, etc.) For this reasons, since its inception, Lutheran pastors (and often others) have had to pledge some degree of allegiance to some or all of the documents in the Book of Concord, promising that they would conform their public teaching to them. The same is true, to some extent, of other documents that emerged from “the confessional age” of 16th and 17th centuries. The Thirty-Nine Articles of the Church of England, the Second Helvetic Confession, The Canons of the Synod of Dort, like the Book of Concord, were intended, to some extent, to define and identify a particular branch of Protestantism. For all practical purposes, the Canons and Decrees of the Sacred and Ecumenical Council of Trent served the same function in the Roman Catholic Church. At least in their earliest use, these documents were more than the “What We Believe” tab on a congregational website; they both prescribed and proscribed what a particular communion believed and taught. What also emerged from this “confessional age” were brief summaries of the Christian Faith, known as “catechisms.” None, to my thinking, are as well-conceived as Martin Luther’s Small [Shorter] Catechism. The heart of this booklet is pithy and memorable summaries of the Commandments, Apostolic Creed, Our Father, Baptism, Confession, and Eucharist. While the larger confessional documents use precise, technical language to demarcate the boundaries of what may be believed, Luther’s Catechism was seen, from the start, as “an extract, an excerpt, a brief summary and epitome of the entire Holy Scripture for people” (Kolb). In other words, it is intended to inculcate the masses with the key Lutheran emphases. The success of Luther’s attempt soon spawned other similar works: “A Catechism” in the Book of Common Prayer, the Heidelberg Catechism, the Westminster Catechism, and even the Roman Catholic Baltimore Catechism. In my search for an Orthodox equivalent to the Lutheran Confessions, I was heartened when I came across the list of “Symbolical Books” in The Orthodox Church (Ware, 203). As I skimmed through this list of thirteen documents, I thought I had found something akin to the Symbolical Books of the Lutheran Church (as A.C. Piepkorn liked to style the Book of Concord). However, as Ware states, those thirteen documents do not at all serve the same role as a doctrinal standard in the Lutheran sense. They may be seen as respected supporting documents for what the Orthodox Church teaches. But the Orthodox “symbolical books” do not function on the same level as the Protestant confessions. 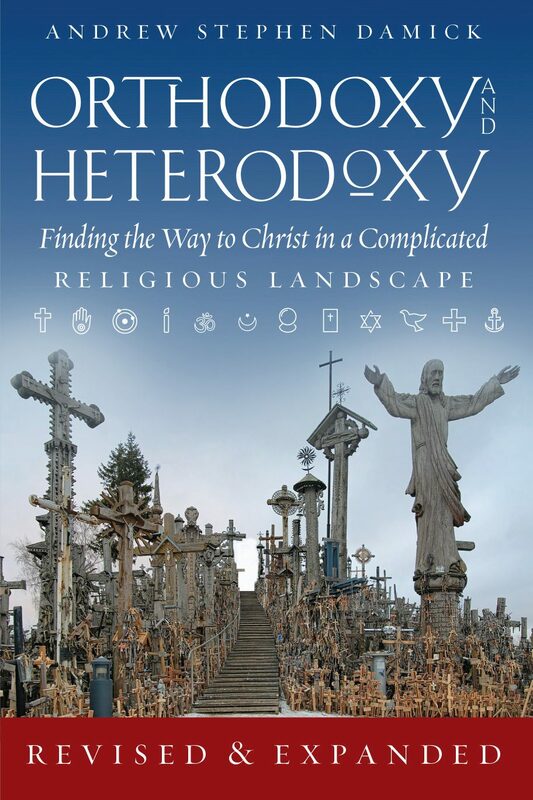 They are not “subscribed to” by priests or bishops; they are not seen as the basis for Orthodox identity; they are not regularly quoted or referenced as the standard for Orthodox teaching; and they are not accepted with the same reverential deference as the Protestant confessions. Since I could find nothing that compared, in my mind, to the Protestant confessions, I was initially led to conclude (as others have) that the Orthodox must have no true doctrinal standard; or that its doctrinal standard is similar to nailing jello to a wall. However, my frustration was soon displaced with another realization: that I was asking the Orthodox Church to measure up to standards that were forged in the Western Church during the Late Middle Ages and popularized as means of polemics during and after the Reformation era. In addition, I also began to realize that the Protestant confessional standards were, in point of fact, their own attempts at recasting, modifying, and reforming Tradition. This occurred in two ways. Firstly, these documents changed the previous understanding of creeds and confessions from descriptions of the Faith to definitions. Previously, among the earliest theologians—including those who learned from the apostles—the Tradition (also known as “the canon of the Faith”) referred not to a “body of literature” but to a matrix of items which we may loosely group around these headings: Scriptures, liturgy, creeds, accepted interpretations of the fathers, and ethical norms (canons). These groupings, while not necessarily exhaustive, were neither interchangeable nor independent. Rather, they are inter-dependent; and they coexist and cohere in each other. The Protestant confessions reduced Tradition to a series of propositional truths or interlinked true statements. And by requiring clergy to declare formally their adherence to them, each Protestant group understood that its own confession was, to some degree or another, the lens through which Scriptures were to be understood. They were the norma normata—the secondary norm which “decides whether a person has clearly understood the true doctrines of Scripture” (Christian Cyclopedia). In other words, Tradition became nothing more than an aid to understanding the Bible correctly. Secondly, and of much greater import, Tradition was reduced to tradition. For the Orthodox, Tradition conveys Truth. It seeks unity not in agreement over true statements or propositional truth that creeds have in common. “Tradition is not static but dynamic, not defensive but exploratory, not closed and backward-facing but open to the future. Tradition… is not merely a formal repetition of what was stated in the past” (Ware, “Strange But Familiar”). So, instead of interlinked sets of truths, Tradition is the Spirit of Truth, whom Christ sends from the Father, who proceeds from the Father, who bears witness of the Son. If it is true that Tradition is the Spirit breathing the Word to life in the Church, then it seems clear that the most ready access to the Church’s Tradition is in the liturgy. But the comparison could not be one-to-one (i.e., comparing Protestant liturgy with Orthodox liturgy). For the Protestant confessional standards, based on the notion that confessing the Christian faith was, ultimately, tied down to a series of well-formed summaries, produced two liturgical conclusions: that the learning the Christian faith (and, in some cases, belief itself) was a pedagogical exercise; and that the liturgy itself had a supplementary and supporting role in inculcating Christian understanding. In other words, the 16th century understanding of “confessions” or “confessional statements” drove a wedge between liturgy and dogma, in such a way that right teaching (ortho-) did not necessarily result from right worship (-dox). Hence, my quest for an Orthodox “confession of the faith” led me, finally, to compare the Protestant confessions with the Orthodox Liturgy (both East and West).1 For, amongst the Orthodox, the liturgy is the reference point for all that is believed and confessed. This is because, for the Orthodox Church, the liturgy is not merely a weekly gathering in order to teach and uplift, but the constituting of what the Church is on earth. So it’s not just about rightly formulated texts. The liturgy is the living movement of the Holy Spirit, inspired by Him in the same way that He inspired the Scriptures, in order both to embody Christ in us in a real way that exceeds our reality, and at the same time to have us embodied in Christ so that we are truly His body. The liturgy, then, is Christ Himself manifest in various media, including as the “confessional document” of God. At least, that is what St. Ignatius of Antioch (Philadelphians viii.2) indicates when he states that “Jesus Christ is the original document.” In this way, the gathering of the faithful, living and departed, is the gathering around the very Word of God, Truth in the flesh, in His Father’s kingdom. Perhaps my point can be illustrated in this way: It is universally understood that the driving force for determining the canon of Scriptures was not so much to resolve a controversy of which texts were suitable for locating doctrine (sedes doctrina). In other words, it was not about establishing reliable teaching texts. Rather, the canon was ultimately the product of determining which texts were suitable to be read liturgically—in other words, which writings faithfully voiced what the Lord said to His Church in her prayer. Said yet another way, the Bible is first of all a book of the liturgy, a book of prayer and proclamation rather than a book of instruction; and secondarily, a book to study in order to enhance and enliven the liturgical prayer; and only tertiarily, a means of elucidating and grounding the doctrine or creed that is prayed. The liturgy as “prayed creed” is the proper locus for Orthodox identity, rather than any confession produced in the heat of controversy. In the words of Anastasios Kallis, “The identity of Orthodoxy consists neither in a doctrine nor in an organizational system, but in the correct praise of the Triune God, which has its center in the celebration of the Eucharist, or simply in the Liturgy, through which the one congregation assembled in the name of Christ becomes his body, his church” (Pelikan, 405). This is because “the Church, according to the Orthodox understanding, is primarily a liturgical community, which expresses its true self through invocation and doxology. Worship comes first, doctrine and discipline second” (Ware, “Strange but Familiar”). According to Jaroslav Pelikan (a former Lutheran), Orthodoxy’s particular view of liturgy as prayed creed indicates “a principal reason for [the] ambivalent position of ‘symbolical books’ within… Orthodoxy” (ibid.). There is, of course, more, since liturgy, for the Orthodox, is within the matrix known as Tradition. For this introduction, however, it may be sufficient for the Lutheran or Protestant to examine the liturgy of the Orthodox Church alongside various confessional documents as a means of making a fair comparison of what is believed and taught. Vladimir Lossky. “Tradition and Traditions” in Eastern Orthodox Theology: A Contemporary Reader. St Ignatius of Antioch. Early Christian Fathers. Edited by Cyril C. Richardson. By “liturgy,” I mean the rites and ceremonies (words and actions) of not only the Divine Liturgy (Mass), but also the prayer hours and occasional services (sacraments, blessings, etc.). The Orthodox confessions are not the “locus” but they certainly serve a purpose. …one of them being protection from heretical infiltration. For example the universal condemnation of Calvinism contained in the Council of Jerusalem 1679, will succintly address the issue as to whether one can believe the T.U.L.I.P. of Calvinism and be an Orthodox Christian. The Council names the calvinst heresy directly and anathematizes it. A Liturgical prayer could potentially be reinterpreted to fit into the calvinst schema. So these confessions are not the Locus but they do give support to the Liturgical prayers and their real meaning so they cannot be reinterpreted to be compatible with alien heresies. I concur with you that our Faith is expressed and formed in the Liturgical Prayers of the Church. Even the Holy Bible itself is of the Liturgy, being compiled with Liturgical criteria in mind…as you pointed out . It is distinct but not seperated from the Liturgy. In fact, Every aspect of tradition mutually supports all the other aspects. It is a glorious and beautiful reality. It all manifests the Divine Truth in unity. Important observations….I had never thought about how our confessional statements are not the same thing or have the same purpose as the Protestant confessions. Thanks for sharing this with us. I’d be interested about which denomination this was. There is an ongoing identity crisis even in self-consciously confessional denominations. Before becoming Orthodox, I was a “man under care,” i.e. fulfilling prerequisites for ordination, in a small, conservative denomination, the Orthodox Presbyterian Church (OPC; I guess I just dropped the ‘Presbyterian’). A fundamental component was several written exams and oral exams presupposing my adherence to the Westminster Confession of Faith (WCF). One final part of the process was going to be an explicit inquiry about any exceptions I take to the WCF on the floor of the presbytery (a public, oral exam before an ordination review board). Depending on the exceptions, ordination was approved or not. Even though the OPC is a staunch, conservative body, and although they do not grant exceptions willy-nilly, I was nonetheless surprised at the variety of exceptions that were approved (and the variety of worship praxis tolerated). The warrant for departing from the WCF was unclear (ditto departing from historic Reformed worship praxis) and became the initial motivator goading me to re-examine the role of the WCF for the Reformed—and eventually theology in Protestantism in general. This second-look anyway led me along a very similar trajectory of reasoning and inquiry as Fr. 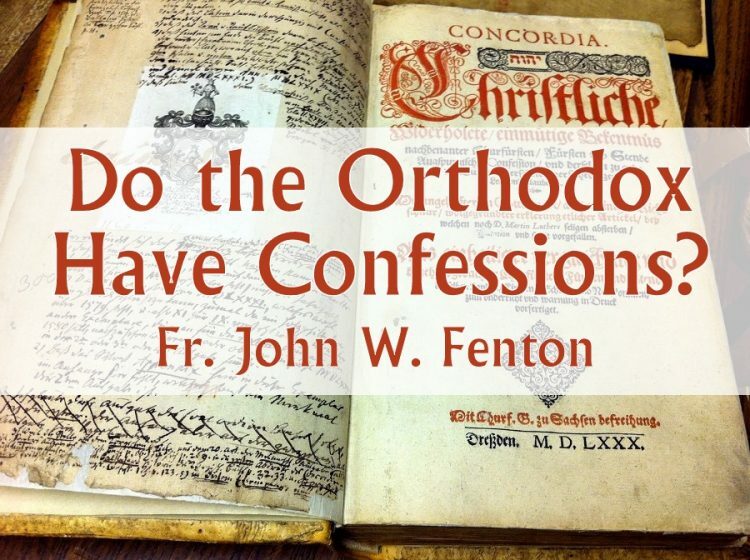 John Fenton, whose original essay on the Lutheran confessions and a few catechism classes helped me at that early stage.